Working on a word search can be a fun and educational activity for kids and these spring-themed word searches are appropriate for the classroom or home use. If you need help downloading the printables, which include answer keys, check out the Adobe Guide for troubleshooting tips and tricks. 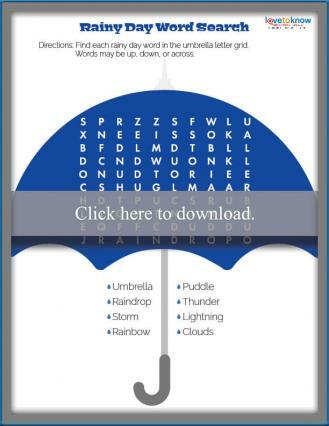 With only 8 words to find kids in grades K-2 can complete this easy word search featuring words associated with a rainy spring day. Words are only found vertically or horizontally and the smaller letter grid makes the activity less challenging. 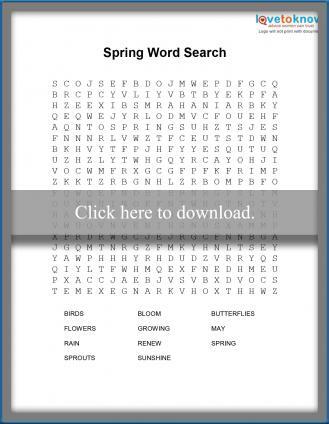 This word search contains 11 words that can all be associated with spring. It provides an opportunity for younger children to add a few larger words to their vocabulary. Words are placed horizontally, vertically, diagonally and even backward. Spring is a season filled with new life and kids will really enjoy looking through this search to find many of their favorite animals and bugs. With 13 words to look for, this search might take a little longer to complete, but kids will love the challenge. The majority of these words are recognizable to even the youngest readers and they run backward and forward, horizontally, vertically, and diagonally. 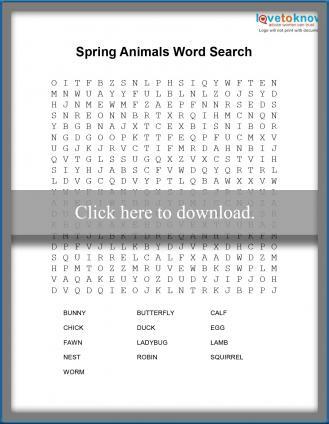 If you're learning about the first day of spring, this medium difficulty Vernal Equinox word search is a great lesson companion. The larger letter grid and need to find 10 words either horizontally, vertically, or diagonally make this word search appropriate for older elementary students. 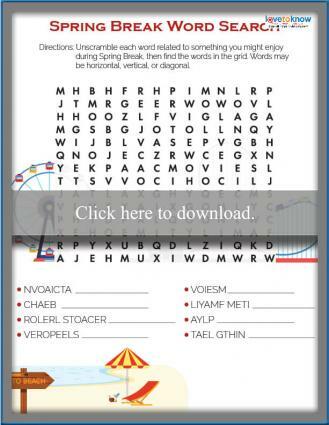 This Spring Break themed word search is extra difficult because kids first have to unscramble the words they will look for in the large letter grid. Once students have figured out which words they are searching for, they'll find answers horizontally, vertically, or diagonally. Word searches are a great independent activity and time filler, but they can be used in so many creative ways. Kids will enjoy them more if the word game is part of a complex or active activity. Remind kids to crosswords off the list at the bottom of the page as they find them. Pair word searches with other themed activities for a diverse lesson plan about spring. Make it a competition by timing students. Turn it into a relay race where each person on a team has to find one word before the next teammate can start looking. Project the word search on the wall or your SmartBoard and complete it as a group. Print out a copy of each word search and staple them together with spring coloring pages to make activity books at Easter or before Spring Break. 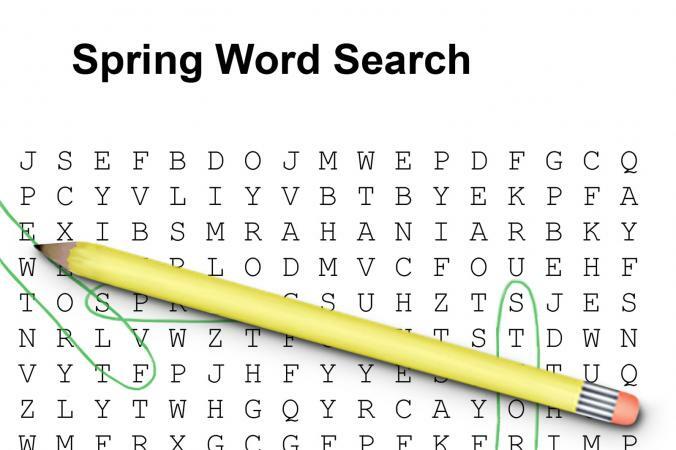 Grade school age children may like working on these spring word searches just for the fun of it, but they're also improving their reading, spelling, and concentration skills at the same time. 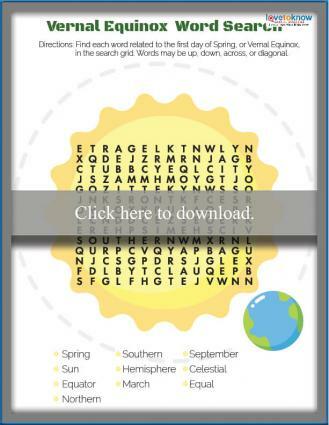 With a variety of themes and difficulty levels, there's a free, printable word search for every kid.